We all hope our lives make a difference. I've been privileged to do oral histories and at other times help young people do it, too. Additionally my reenactment of Liberetta Lerich Green started with her oral history telling about growing up on a Michigan Underground Railroad Station and her family's Civil War experiences. The title story in Harold Courlander's The Cow-Tail Switch and Other West African Stories shows the value of remembering people's lives. Never overlook the value of putting something in a format available to future readers or listeners. Whether they are the descendants of the person interviewed or not, the interview becomes precious beyond any time or expense involved. Two easily overlooked groups who can especially value doing this are people with no children and those diagnosed with Alzheimer's disease in the early stages. It's their way to stay alive! I'm always indebted to my fellow storytellers for their ideas. Great storytelling resources come from a very active international email list, Storytell, and the online network, Professional Storyteller , (where I'm an assistant administrator to nearly 1900 members from around the world). I hope these suggestions from my storytelling friends help you do an oral history project. The ideas were so plentiful this topic will have three more parts. Lynn Rubright's excellent book, Beyond the Beanstalk: Interdisciplinary Learning Through Storytelling, (published byHeinemann, 1996) will be discussed in the final part of this four part series of blogs. Renee Englot offers a three-part look at the interview: Framing Questions, Tips for Shaping and Conducting the Interview, and finally After the Interview. Each is a complete document, so her contributions will be a separate post, Staying Alive with Oral Histories - Part 3. Prolific blogger, storyteller Karen Chace, has collected a number of resources on this topic. She plans to update her "Preserving our roots collecting family history" so look to see if she mentions having added to it recently. Here in the Ann Arbor area, storyteller and former media specialist, Judy Schmidt, added both a basic "Ten Tips for Taping" and other recommendations in Part 2 of Staying Alive with Oral Histories. 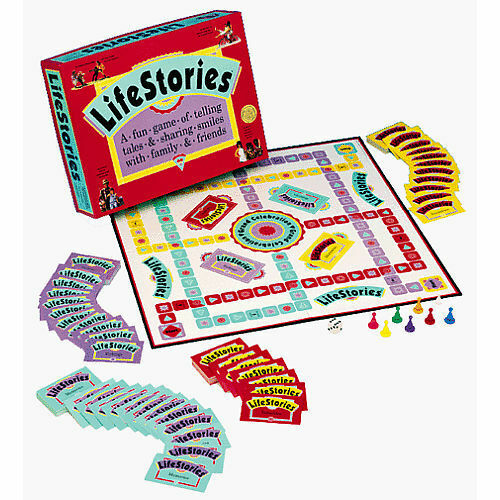 Something I first heard about years ago on the Storytell list was this playful way to bring back memories, the game, Life Stories. It's available and thoroughly reviewed on Amazon (in the Toys and Games section). If you can't do an oral history project, I suggest you at least create an interview document for people to use in self-recording. That's not as "magical" as what pops up in a live interview, but at least it's not dependent on grant funding. This is the end of Part 1 - Staying Alive with Oral Histories. See Parts 2 and 3 with guest authors, Judy Schmidt and Renee Englot and then the bibliography in Part 4 of Staying Alive with Oral Histories featuring Lynn Rubright.